Available for free to youngsters aged between 10 and 16, SoundLab-COV promotes musical excellence through enabling young people to have a creative voice. 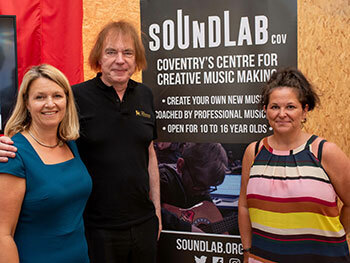 Along with partners Coventry City Council, Positive Youth Foundation and Coventry Music Hub, SoundLab-COV’s team of dedicated alumni and associates from the Conservatoire will help guide young people from across Coventry to achieve their maximum potential. SoundLab-COV’s inaugural event was supported by Jamaican born singer Neville Staple – best known as a founding member of Coventry ska band The Specials – who performed at the launch on Tuesday 10 July with his wife and fellow artist, Christine ‘Sugary Staple’. 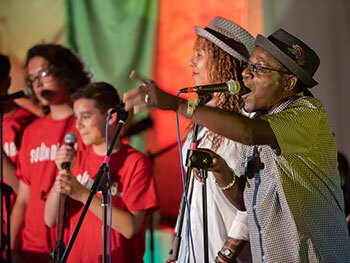 In its pilot phase, 900 youngsters have already participated in workshops and performances with SoundLab-COV. A core group who have formed over the last three months performed at the launch, which was held at The Box, FarGo Village on Far Gosford Street. 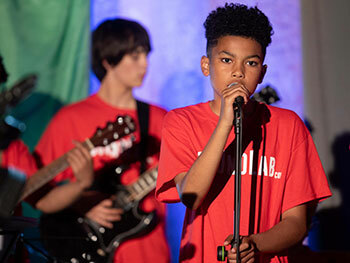 Groups of youngsters showcased various musical genres in-the-round, with a gathered audience of 100 guests enjoying acts in a format similar to the TV programme ‘Later... with Jools Holland’. VIPs present included Professor Alison Honour, Pro-Vice Chancellor and Executive Dean of Birmingham City University's Faculty of Arts, Design and Media, Royal Birmingham Conservatoire Principal, Professor Julian Lloyd Webber, and Chenine Bhathena, Creative Director for UK City of Culture 2021. “Its fantastic news for Coventry that Royal Birmingham Conservatoire are working with us in the city to grow the next generation of talented musicians for our region and beyond. By plugging a gap in arts provision, complementing our in and out of school music tuition offer, Royal Birmingham Conservatoire are making music more inclusive in Coventry and giving opportunities to those that simply wouldn’t be able to afford an education of this ilk otherwise, enabling more children and young people to explore a wide range of music styles and genres. SoundLab-COV aims to provide the benefits and life changing inspiration of music to youngsters by establishing a regional force for good. As well as providing transformative music education activities, the facilitators – including sound artist Sarah Farmer, pianist and composer David Austin Grey, and producer Zeddie – will also be acting as positive role models for youngsters in Coventry. “Although we have our Junior Conservatoire and our new home in Birmingham which remains the central hub for our programme of widening participation within the wider region, it is also important that we work in the heart of the communities we are aiming to serve. Following the launch, SoundLab-COV participants have an intensive weekend on 14 and 15 July at City College, and will then meet every Saturday from September for collaborative music-making, with the scheme fully funded for at least the next three years. For more information and to apply for SoundLab-COV, please visit the project’s website.